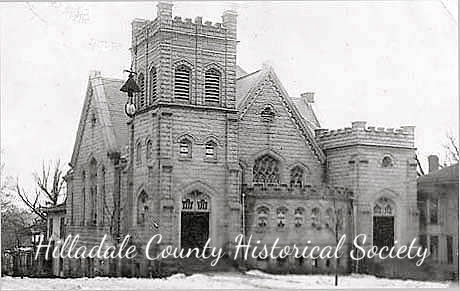 Settlers put down roots in Hillsdale with the establishment of a school to build minds and a church to nourish souls. Often the same building was used for both. 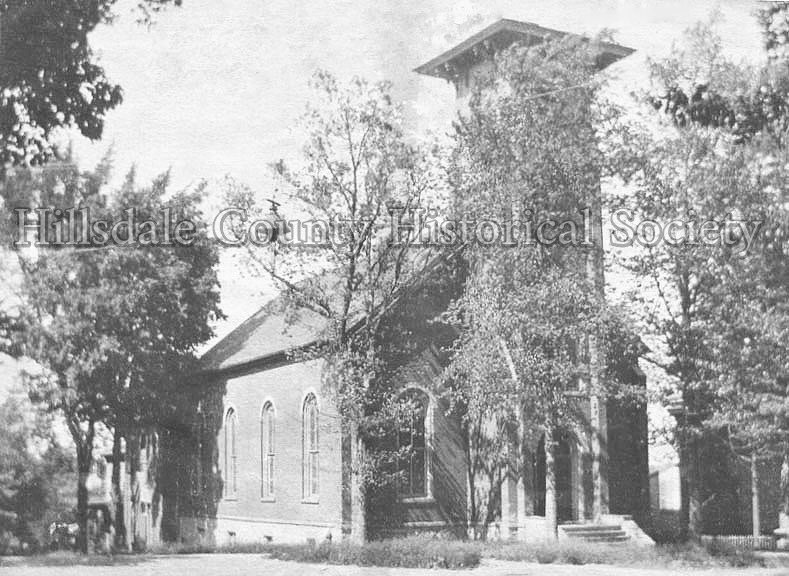 Schools acted as meeting houses for the Presbyterians beginning in 1843 and the Methodists beginning in 1842. The Episcopalians began meeting in 1839 in Adam Howder's Tavern whenever the rector of Jonesville's Grace Episcopal Church was available. St. Anthony's Catholic Church was established in part for the "navvies" who emigrated from Ireland to work on the Erie Canal. With that completed, some came to Hillsdale County to build railroads before settling down to become farmers. 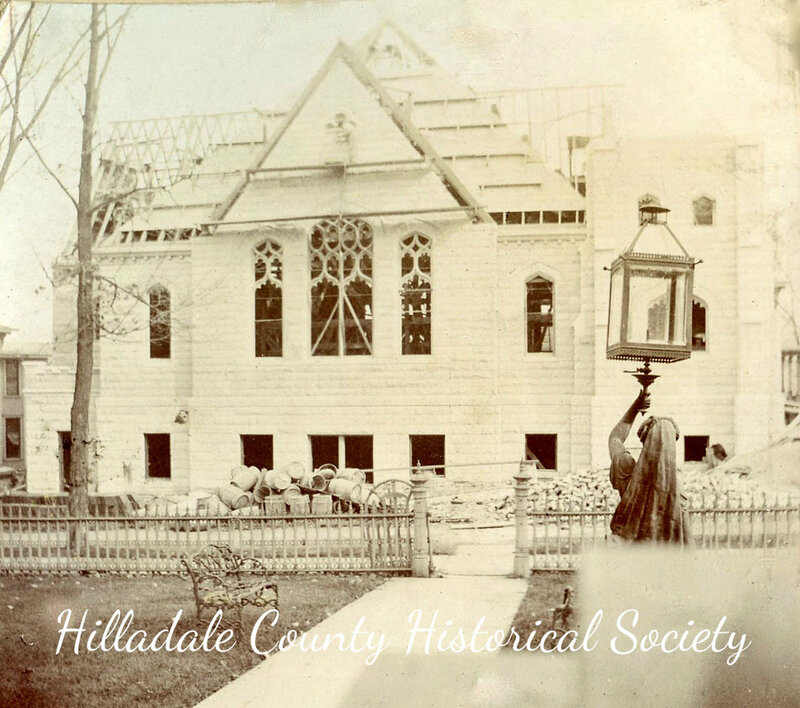 When the city fathers hurriedly built a log cabin to act as the courthouse after Hillsdale was named the county seat in 1843, it was soon apparent that it was too small. The Presbyterian Church was put to use as an annex. Located across Broad Street from Courthouse Square, it was a courtroom during the week and a church on Sundays. Later the Presbyterians erected a second wood-framed building at the site of the current St. Anthony's Catholic Church. It was used until 1856, when they built a brick church at the corner of Manning and North streets. In an era when fires were all too frequent, this seemed like a very smart choice of building material. Unfortunately, in early 1899 it burned anyway. 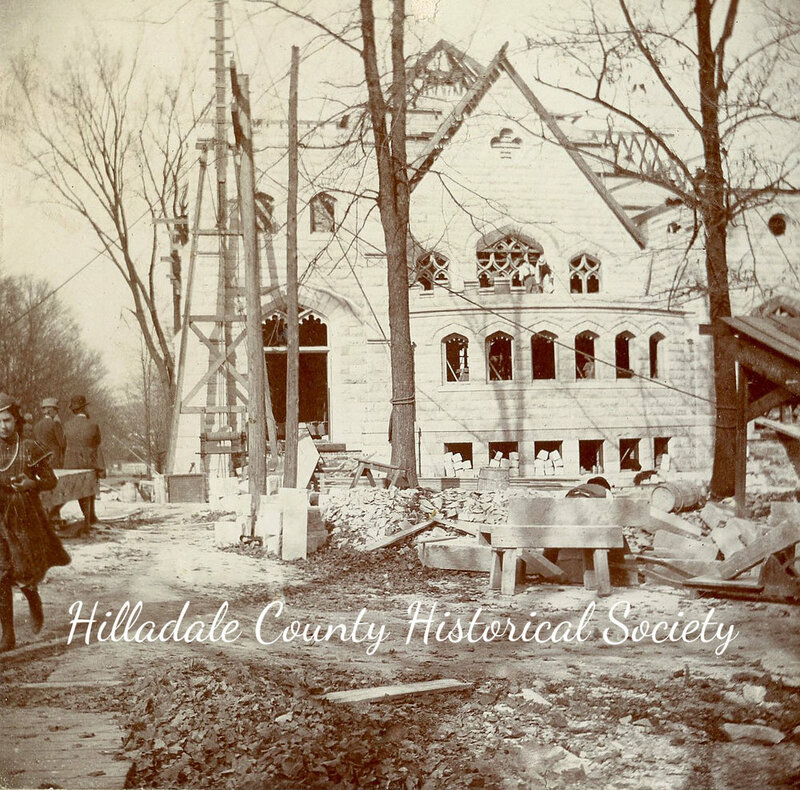 The current Presbyterian Church rose from the ashes when rebuilding began seven months later. It has lovely Tiffany glass windows with the names of early members. Several of these men also gave their names to streets in the fledgling city, among them Budlong, Manning, McCollum, Mead, Ferris, Cook and Waldron. When the Presbyterians moved to Manning and North streets, the Catholic mission from Adrian purchased the church they left behind. It was used until the current St. Anthony's Church was built in 1883-1884 by W.H. Meyers & Son, who also built the Keefer House hotel and the county jail. In 1955, ground was broken for a parochial school. It educated many children until dwindling enrollment forced its close in 1985. St. Peter's Episcopal Church, next to St. Anthony's, used the Michigan Southern Railway depot for services after the church was formally organized. 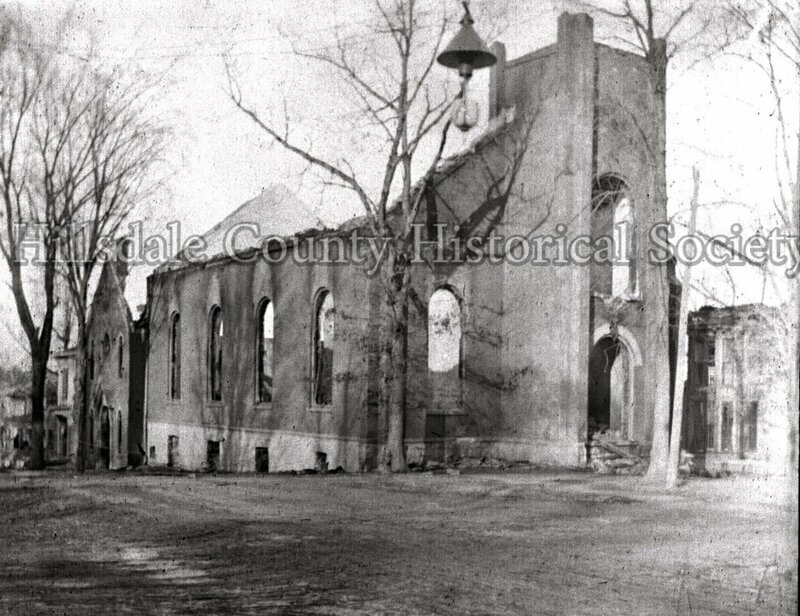 That worked until the depot burned, after which they rented the Methodist Meeting House on Howell Street. The Episcopalians finally built their own church in 1858, and, like many other churches, sold the exclusive use of each pew. The purchase prices went from $40 to $125, and the sale turned into an auction when more than one family wanted the same pew because of its desirable location. In the Hillsdale Standard of May 1868, notice was given of a new price list for the rental of pews at St. Peter's Episcopal Church.Instead of replacing the original church when it began to show its age, major alterations were done in 1881. The Episcopalians managed to get through the age of kerosene lamps and wood or coal heat without burning. But then, in 1935 and again in 1965, they joined the ranks of buildings hit by fire. The congregation faced rebuilding as an opportunity, adding improvements as repairs were made to their edifice. The Methodists didn't escape the ever-present danger of fire either. Their Meeting House across from Courthouse Square burned to the ground, along with four neighboring buildings, within an hour and a half in 1863. Courageous town folk were able to save only the organ and some church fixtures. The church leaders exchanged the ruins for a location on the corner of Manning and North streets, where the first services in their new church were held in 1864. The almost-inevitable fire struck again in 1868 and 1881. The latter destroyed the New England steeple that was the pride of the congregation, but failed to alter their dedication to their church. The College Baptist Church, like Hillsdale College, benefitted from the energy and dedication of Prof. Ransom Dunn. With other college professors, Dunn wrote Articles of Association for the church in 1855, the same year the college was incorporated. After a trip to Europe with his son Wayland, who drew sketches of the magnificent cathedrals they saw, Prof. Dunn and other church leaders oversaw the hiring of an architect from Chicago to design the College Baptist Church. Pews sold for $20 to $200 to help finance the building. Despite the depression of 1857 and the Civil War, with the willing labor of the members the church was built on the corner of Manning and College streets by 1869 and was said to be the largest church in the west. With services on Sunday from 10 a.m. to 1:30 p.m., 3-4:45 p.m. and 7:30-9 p.m., the members got their money's worth of preaching from Ransom Dunn! In the autumn of 1923, the Ku Klux Klan was making inroads in Hillsdale County, with outside agitators arousing racial, ethnic and religious hatreds. Veiled by sheets, local members hid their identities, although it was known that several Klansmen were from the college. In October of that year, W.H. Roberts, the pastor of the College Baptist Church, announced that he would preach on the KKK. His views were unknown and an immense crowd came to hear him. Pastor Roberts delivered a thunderous and memorable sermon powerfully denouncing the Klan and the hatred they espoused. The Seventh Day Adventist church, built on the corner of Vine and State streets in 1885, is insignificant compared to the magnificence of the College Baptist Church, but the congregation was no less committed to providing a place of worship for themselves. They first met in 1857 in a small white house built for their use in the back yard of a member. This was way too small, but it took almost 30 years to amass the money needed to build the church they still use today. In 1947 the Adventists established a school on State Street, outside the city limits, with a Community Services annex on the front, neither currently functional. The members of Trinity German Lutheran Church first met in 1847 in a log cabin. By 1854 they were formally organized and built their church on Griswold Street. Their school was located in an upstairs room of the parsonage, with lessons in German from Monday through Thursdays. The students went to Dutch Hill School, conveniently located next to the church, on Fridays, where they spoke English. When the Hillsdale Community Schools closed Lake View School, which replaced Dutch Hill School, Trinity Lutheran Church purchased the building. It's now a community center called Luther Hall. The grand steeple of St. Anthony's Catholic Church. In the background is Stock's Mill before renovation, with the water towere across the street in the park. The Presbyterians went to work immediately, building a new edifice after the fire of 1899.